Could it be that times are too good for the Boston Bruins? You could say that is the case for the Bruins, who are enjoying strong revenue from multiple streams. 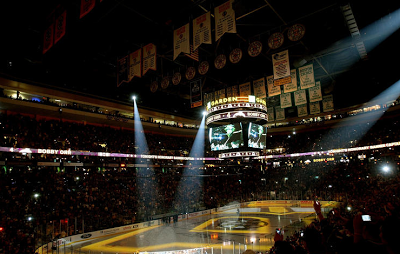 But with a surge in popularity beginning in the 2008-09 season and highlighted by the championship season of 2011, the Bruins are close to maxing out some revenue streams including season tickets and sponsorship sales. Season tickets are once again sold out this season, and have a long waiting list. With revenue streams maxing out, the Bruins will need to seek new ways to generate revenue. It's the problem every sports franchise wants to have, as the Bruins' popularity shows no signs of slowing down. It's little examples like Comcast SportsNet airing a special thirty-minute Bruins post-game show immediately following Thursday night's opening night game on NESN. Five years ago, no such thing would ever occur. As for attendance, the Bruins have reached 100 percent capacity since the start of the 2010-11 season. The Bruins were just short of that mark in 2008-09 and 2009-10, reaching 97 percent and 99 percent capacity respectively. While the Bruins are hot at the gate, the television numbers are just as good. Bruins television ratings were up 41 percent last season from 2011-12, good for the third-highest television rating in the National Hockey League during 2012-13. As the Bruins come close to maxing out important revenue streams, it appears that times are in fact too good for the franchise. That's one problem the Bruins won't mind facing.